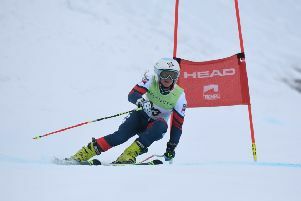 British Olympian Dave Ryding defended his slalom title for the ninth time at the Delancey British Alpine Skiing Championships in Tignes on Friday. The 31-year-old, whose ninth-place in PyeongChang was the best individual result by a British alpine skier in 30 years, demonstrated his quality in the French Alps with a combined time of 1:25.81. Fellow Olympians, Laurie Taylor, Alex Tilley and Charlie Guest, with whom Ryding finished fifth in the team event in PyeongChang last month, were also on display throughout the last two days and each claimed a national title in one discipline. Ryding said: “Ninth one now, so at least I’ve got nine! “Obviously you’re always expected to win the next one but it’s nice to have nine. “It’s a proud achievement; nine in 11 years – you’ve got to be in the finish a lot as well so it’s not easy. “My skiing was nothing special, but it’s always tough at the British Champs, especially with these conditions. “My setup is for the World Cup, for the icy piste so you come here and it’s all very different. Despite the victory at the British Championships this week and the amazing performance in South Korea, Ryding admits he has been frustrated with his season. He said: “It was like going 12 rounds with Mike Tyson! “Obviously I had some really good skiing in there. I was winning the first race (in Levi, Finland), leading at the last split in Madonna (di Campiglio, Italy) but never without mistakes. “It was frustrating, but I fought as much as I could to keep my position, keep my ranking and in the end I was 13th. “While last year I was eighth and I slipped to 13th, it’s still very respectable and it’s still in amongst the best in the world. “So, tough year, but hopefully I can regroup, reset, freshen up the mind and everything and then come back ready in the summer to iron out the mistakes and keep the speed. “This is my last race so just more training now, getting things together for next year while the snow’s still great and then shut it down and head to a beach! “But it comes around so quick, before you know it I’ll be back training in the summer and getting ready for next year. As one of the more experienced athletes at the Championships this week, Ryding claimed the young guys are really starting to push him, but believes that can only advance British skiing. “I keep battling on at these national champs and see if I can keep the young guys behind me but it’s getting harder and harder,” said Ryding. “The younger Brits are coming which is cool, but it makes my life more stressful, but the next generation is bang on where it needs to be.